Forget fussing about a long list of ingredients to buy, sweating in the kitchen and minding the cake in the oven. 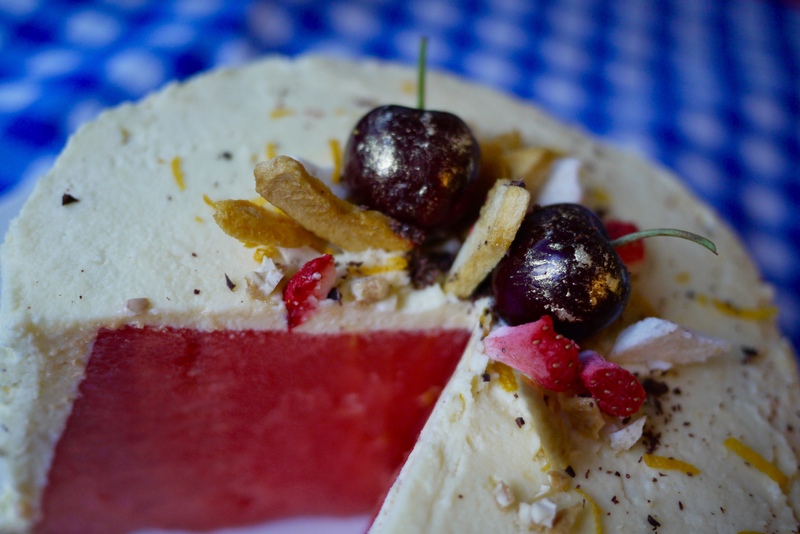 Let me introduce you to a cake that is revolutionary and made from only 3 simple ingredients; Fresh Watermelon Cake! 1 teaspoon honey, I used Manuka but any would do. *This is entirely up to your imagination. 1. Carefully slice the watermelon to shape of the cake you desire, keep in fridge to chill. 3. Pour the chilled cream into the pre-chilled bowl and beat on until it holds soft peaks add in honey and continue to beat until it is well incorporated. 4. Remove the watermelon from the fridge, gently dab it with a clean paper towel to remove any residual moisture (this will help with keep the cake intact) begin frosting starting from top and work your way down. 5. Decorate with desired toppings. 6. Keep chilled until ready to be served. I found a video link on how to cut out a watermelon cake in case require more guidance is required.